A nice and clean option is to have Python read the dictionary information from the Excel sheets. The cell contents can then be inserted into standard VARIABLE LABELS and ADD VALUE LABELS commands. 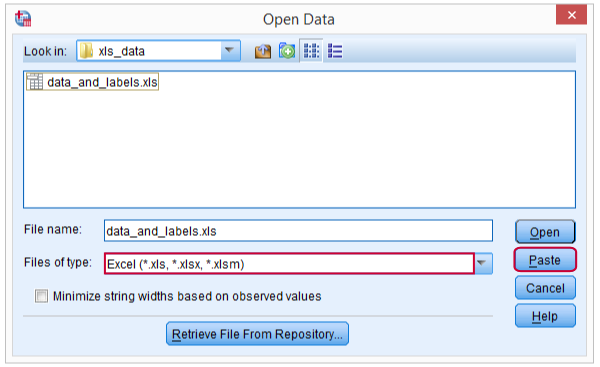 Running these commands applies the variable labels and value labels to the data values. We'll use data_and_labels.xls for demonstrating this approach. Reading Excel data values into SPSS is straightforward. We usually paste the required syntax from File Open Data. The screenshot below shows which options to select. *1. Read data values (pasted syntax from GUI). Let's first open our workbook and take a look at how the second sheet is structured. As shown in the screenshot below, the first column holds variable names and the second variable labels. Now we'll read this second sheet with Python instead of SPSS. Note that you need to have the SPSS Python Essentials as well as the xlrd module installed first. The syntax below shows how to create the VARIABLE LABELS commands as a single (multi line) string. For now we'll just print it for inspection. *2. Create and inspect VARIABLE LABELS commands. Remember that Python objects persist over program blocks. We can therefore leave out the first lines of syntax from the previous example. The Excel sheet holding value labels has the same basic structure as the one with variable labels (see screenshot). The main difference is that we'll now insert three pieces of information (variable name, value, value label) into each line. We'll generate our ADD VALUE LABELS commands as shown below. *3. Create and inspect ADD VALUE LABELS commands. If neither of the generated commands require any further tweaking, the only thing left to do is just run them by using spss.Submit. The syntax below does so and thus finishes this job. Before Python was introduced to SPSS, a different approach was needed for this situation. It comes down to declaring a new (long) string variable and using CONCAT to create lines of syntax as string values. Next, we save the contents of this string variable as a .txt file with an .sps extension and INSERT it. We don't usually recommend taking this approach but we'll present it anyway for the sake of the demonstration. Some of the commands used by the syntax below are explained in SPSS Datasets Tutorial 1 - Basics and SPSS String Variables Tutorial. cd 'd:/downloaded'. /*or wherever Excel file is located. *2. Read data values (pasted syntax from GUI). *4. Create syntax in data window. compute syntax = concat("variable labels ",rtrim(v1),"'",rtrim(replace(v2,"'","''")),"'."). *5. Save variable holding syntax as .sps file. *6. Import value labels sheet. *7. Create syntax in data window. compute syntax = concat("add value labels ",rtrim(v1)," ",ltrim(str(v2,f3)),"'",rtrim(replace(v3,"'","''")),"'."). *8. Save syntax variable as .sps file. *9. Run both syntax files. *10 Optionally, delete both syntax files. Dear Bob, I'm happy to hear things are working now! Generally,  refers to the first sheet,  to the second and so on. With the variable and value labels in sheets 2 and 3, the indices for this example should be  and  unless you removed the first sheet of course. Hi Ruben - I lost your email so am sending this note via your site. I figured it out. On my machine (Windows 10, SPSS V24) I needed the setuptools module. I also had to change this line to read: varLabs = wb.sheets() and not the  index. Works well now! add files file */keep v4 v12 v35 v51. Alternatively, you could have Python read only columns of data values marked with a 1 in some row but then you'll have to somehow pass these values from Python into SPSS -surely possible but harder than the first approach. Is there a way to use Python and xlrd (from within SPSS Syntax) to import only specific columns of data from my XLSX data file? I would like to have a row in my XLSX-file with a variable (eg. 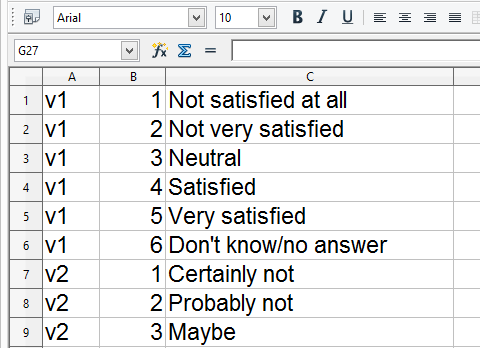 values 0 or 1) defining whether to import a column to SPSS for further analysis. This is because I have lots of data in the excel sheet that I don't need to analyze in SPSS, and restructuring the excel-file is inconvenient.